Some people believe that for an application to be truly useful and worth our hard-earned cash, it needs to be bloated with features and have the aesthetic qualities of a recently discovered Dali masterpiece. There are others, like myself, that believe the best applications focus on one or two features and deliver them perfectly. Unclutter, by Eugene Krupnov, actually focuses on three tasks - however I love them all and this is definitely one of those applications that I qualify as a hidden gem. In it’s simplest form, Unclutter is an app that allows you to store clipboard snippets, drop files and make notes in one easy to access interface. Yep - that’s pretty simple! And that’s what I love about it - in particular the Notes section, which is my main use case for this application. Let me run through each of the features quickly and you can decide for yourselves whether it’s worth your attention or not. 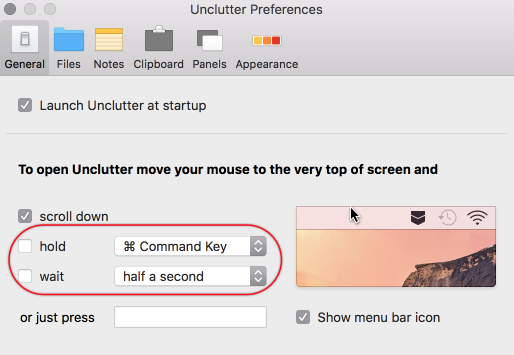 Unclutter is not visible whilst you use your Mac, however you can access it easily by moving your cursor to the menu bar and swiping down. If that action clashes with another gesture you have configured, you can choose an alternative, either holding a modifier key or simply waiting for a period of time (half a second, one or two seconds). Moving to the top of the screen and swiping down is now firmly ingrained as muscle memory every time I think about taking a note. It’s a great gesture, superbly executed. I’d say that the Clipboard is probably the feature I utilize the least as I use a separate third-party application called Copied to manage my clipboard entries - however that isn’t to take away from its usefulness for others. You can modify the number of entries that are stored in the clipboard history (10, 25 or 50 - significantly less than alternative applications, it has to be said) however you can also identify applications that should not store their clipboard information within Unclutter. There isn’t much interaction with the clipboard entries on-hand. I’m told that in previous versions of Unclutter, you could drag text out directly from the panel, however, I haven’t been able to replicate this (happy for you to comment if you have achieved this!). You can click on an entry for a web link and then open the page in your default browser, which is an improvement on previous versions, yet I still find the Clipboard manager to be the weakest of the three features. It’s a nice to have though if there aren’t any alternatives in your list of applications. Files is a genuinely handy feature. You have the ability to drag files from any location and pop them into the Files panel ready for use later. This is useful if, like me, you tend to use the Desktop as a default location for storing random files that you know you are going to be working with soon. Simply drag and drop them into the menu bar and the Unclutter panels open up automatically. Like Finder, you can use Quick Look to get a quick preview of the file. One way that Unclutter has evolved recently is the ability to show the files in List view as well as Icon view and you can also create Folders now within the Files panel to store files. The default location for the storage of these files is deep into your Library, however, you can change this. I now have a Dropbox folder designated for any files stored within Unclutter, meaning that if I am in a hurry, I can just drag some files into Unclutter and know that they will be available on any machine I work on later that day, including my iPad Pro. Files is great - however, I don’t use it as much as I use…. I used to have a system whereby I would leverage nvALT to save any plain text notes on my Mac. This has changed now, thanks to Unclutter. I need to take notes multiple times in an hour when I’m working on any given project. It could be because I’m being disturbed whilst I’m in a focus block of work and need a reminder to contact that person back, it may be taking notes on a certain project I’m working on, jotting down numbers or reference material - anything. I’ve always maintained that the simplest solution to a given problem is always the most effective, so that is why I am now starting all of my Mac notes within Unclutter. It’s like my scratch pad, any ideas or thoughts go in there ready for filing. Like Drafts on iOS, it’s the default location for the majority of my text entries and I can utilize keyboard shortcuts to send the text to the application required. Currently, there are two main applications that suit this purpose - OmniFocus and DEVONthink. Using the Caps Lock demonstrated so ably by Brett Terpstra, I can highlight any text within Unclutter and either hit Caps Lock + O (New OmniFocus Entry) or Caps Lock + N (Create New Plain Text Note in DEVONthink) and it goes to the system of my choice. I can also create new entries in Day One if I so wish. I haven’t looked at other services I can enable as they haven’t come up as a requirement. Like Files, Notes can be stored in a different location to the Default and again, I’ve moved this to Dropbox. You can create multiple notes however the name for these notes in Finder/Dropbox is always in the format Unclutter Notes - Date/Time.txt. I haven’t found a way of easily manipulating this, however, I’m sure if it was an issue for me I could just get Hazel to track this folder and rename with the first line of the draft easily enough. I’m very strict with my workflow, however, and I check the Notes after every session of work, sending them to the correct permanent location. This is an absolute necessity for me as there could be important information within there that needs dealing with that day. Renaming the files and working with them on the move becomes irrelevant for me as they only really end up in OmniFocus or DEVONthink Pro Office anyway. On the whole, Unclutter is great value on its own from the App Store ($9.99) however you can also pick it up as part of the Setapp subscription, with other great apps such as Ulysses (I’m writing this post with now! ).